Project SCIFI is run by an incredible team of volunteer students and scientists who are passionate about their involvement in making scientific experiences available to youths everywhere. Our goal is to give every student the opportunity to see science with the same vigor and excitement we do. Stephen grew up in the small town of Weaverville, California where he developed an interest in Chemistry and Biology. He was fortunate to have mentors who encouraged him to take AP Chemistry; which ultimately set him on a path to graduate from UC Berkeley in 2017 with a degree in Chemical Biology. Currently, Stephen is a graduate student at the Scripps Research Institute pursuing a Ph.D in Organic Chemistry. In his free time, he enjoys exploring the outdoors on his dirt bike. Shashank was born, raised, and educated in the San Francisco Bay Area. Attending public schools throughout his education gave him a chance to learn amongst students from widely disparate backgrounds. He came to recognize that students’ successes were determined predominantly by their attitudes towards education, which in turn were shaped by a myriad of factors: socioeconomic status, belief in self-efficacy and growth mindset, teacher engagement, health, instructional materials, peer influences, and access to academic support services. After graduating, Shashank spent his time tutoring students in underserved middle schools and high schools in the East Bay and had the absolute privilege of hearing students’ stories of academic and personal struggle. In time, he noticed that these students lacked the components he felt were essential for his educational journey: a reliable support system, active learning opportunities, and mentors that believed in his potential to overcome social and environmental barriers. As a member of Project SCIFI, Shashank is incredibly grateful to work alongside a group of people who bring a diverse set of educational experiences and share his passion for providing students with access to high-quality science education. For Shashank, the goal of Project SCIFI is not to push students to become scientists, but rather to equip them with the tools that will allow them to become critical evaluators of information, intrinsically-motivated learners, and active agents in shaping the trajectory of their lives and community. 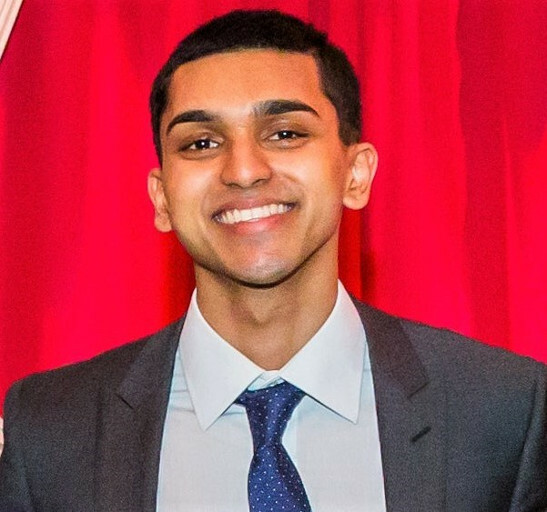 Shashank is currently a medical student at the University of Illinois at Chicago and hopes to devote his career to serving underserved communities through health and education. After learning about Project SCIFI’s work, Niveditha was intrigued by the organization’s unique approach to supporting under-resourced and under-supported science programs, but also by their aim to shift the academic culture in these communities. Drawing from her experiences volunteering in elementary schools in the SF Bay Area, she recalls an atmosphere of apathy that surrounds schools lacking resources. Yet, in spite of their potentially challenging socioeconomic backgrounds, when provided with the right tools and adequate support, students were not only academically successful, but also were inspired to take on more challenging endeavors. Furthermore, she firmly recognizes the crucial role that education plays in the securing the future of scientific America. As such, she advocates for equitable representation of all backgrounds, as it ultimately expands the potential and reach of the field as a whole. As a member of Project SCIFI, she hopes to support and inspire students to find purpose in their education, and ultimately, giving them the tools to pursue their scientific ambitions. Currently working as a Pediatric Research Assistant at the Oregon Health and Science University, she hopes to utilize her education and experience to give back to less-fortunate communities through her commitment to building an enduring foundation for science education. Ali Farzad is originally from Washington, D.C, where he attended a high school that fostered a strong scientific background in all its students. He hopes to spread his passion for science and increase the opportunities students have to engage with this field during their time in high school. He currently studies Public Health at UC Berkeley and during his free time enjoys spending time with his friends. Samir is a Bay Area local from Fremont, California. He is a fourth year public health student at UC Berkeley, where he discovered that his passion lies in health policy and management. Currently, he is working as an undergraduate research assistant in the Prevention Research Center at Stanford Medical School. Aside from conducting community research, Samir’s academic interests lie in teaching, learning, and surveying topics in comparative healthcare systems. Rikki moved around a few times throughout his childhood, but ended up settling in Yorba Linda, California, where his passion for biology and the other sciences flourished throughout middle school and high school. He is currently pursuing a degree in Molecular and Cell Biology at the University of California, Berkeley, whilst also finding time to volunteer at schools in the Oakland/Berkeley area where he teaches students about chemistry and ecology. Eddie grew up in Princeton, New Jersey. At UC Berkeley, he was inspired by his mentors at The Klinman Group, where he studied soybean lipoxygenase-1 as an enzyme model to C-H bond activation and protein global/local interactions. After honing his understanding of research with the guidance from his mentors, he went on to earn his degree in Molecular and Cell Biology with an emphasis in Immunology. 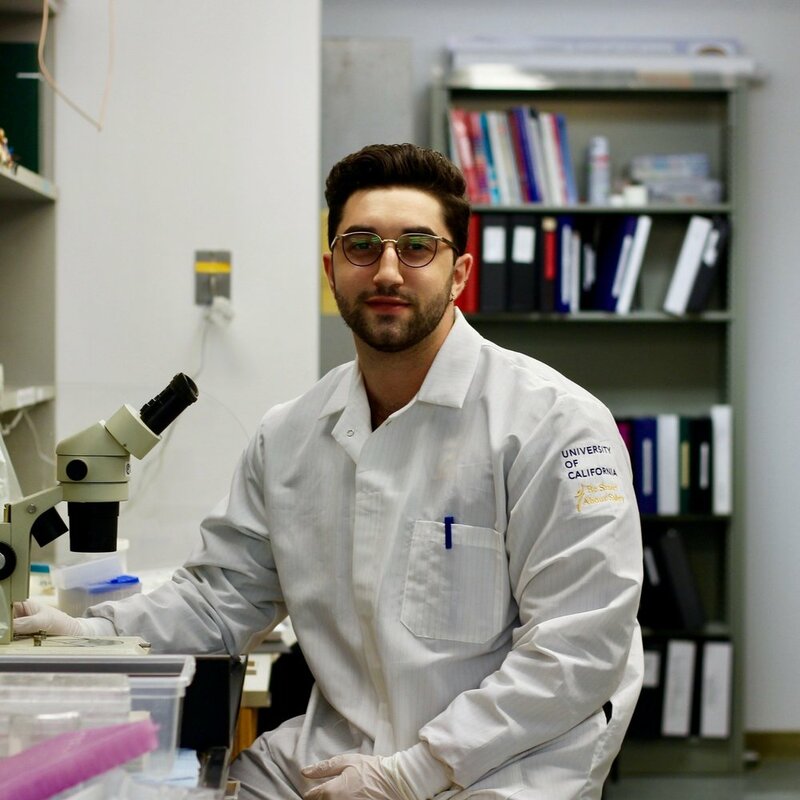 After graduating, he joined a neuro-oncology lab at UCSF to investigate the tumor micro-environment and search for potential drug targets against brain cancers. He hopes his experience in research will help him become a good oncologist one day. His hobbies include photography, music-making, raising bunnies and drinking tea. Sofia Moon was born in South Korea and raised in Mexico City. After moving to the States for college, the values and attitudes towards different cultural foods stemmed her fascination in nutrition and health. After graduating with a bachelor’s in Nutritional Sciences Dietetics in UC Berkeley, she completed her dietetic internship and is currently working as a clinical dietitian at UCSF Medical Center. With graphic design as one of her hobbies, she hopes to use design to deliver thoughtfully crafted health and educational solutions. Michael is currently studying neurobiology in college. He works in a lab that explores how certain genes regulate the development of neurons. He enjoys science because it is constantly progressing and evolving and to be a part of it is incredibly exciting. Running experiments, collecting data, and then realizing that the data you’re holding may contribute to this advancement in science is a really cool feeling. He is a part of Sci-Fi because he wants more people to have the opportunity to experience that same feeling. A fun fact about Michael is that he’s played ice hockey for 16 years and is currently on the Cal Ice Hockey team. Ipsit grew up in India and moved to California later in his life. Here, he noticed the vast difference of the educational systems. Ipsit's passion for providing students with access to a proper education grew. He created his own nonprofit, Breaking Barriers, to provide school supplies to poorly funded schools in India. After transferring to UC Berkeley, Ipsit continues his commitment of contributing to the educational reform by teaching at elementary schools in the San Francisco Bay Area. Parmis currently resides in Los Angeles, California where she grew up with a great interest for science. Being originally born and raised in Iran, where pursuing science was not the norm for women, she was determined to pursue science and medicine as a career. Parmis is currently a senior at UC Berkeley majoring in Molecular and Cell Biology, with an emphasis in Immunology and Pathogenesis. She has been part of the Lishko lab since December 2015, where she has been working on projects devoted to understanding and fixing male infertility. During her free time, Parmis likes to read, work out, and travel. Atrey grew up in the vibrant and diverse Bay Area. He attended Lynbrook High School where he developed an interest in the Biology, Chemistry, and Physics. He spent his summers working in various labs and offices, where his mentors inspired him to pursue his scientific curiosity. Currently, Atrey is pursuing a degree in Bioengineering at the University of California at Berkeley. In his spare time, Atrey likes to sing, lift weights, and play basketball. Calvin was born and raised just outside of the city of Los Angeles in Granada Hills, California. As a child, he loved going to The California Science Center, and quickly developed an interest in biological systems. He is currently pursuing a Bachelor of Science Degree in Molecular Environmental Biology at UC Berkeley. During the school year, Calvin is also a BASIS mentor and volunteer, where he teaches science lessons and shares his passion for science to elementary students in the Berkeley/Oakland community. In his free time, Calvin enjoys playing tennis, cooking, and exploring the city of San Francisco. Chase comes to us from the faraway town of Cromwell, CT. From an early age, he was consistently drawn to the uncertainty and certainty that came with science. He is currently pursuing a degree in Molecular and Cellular Neurobiology at UC Berkeley and hopes to attend medical school after he graduates in 2020. In his free time, Chase de-stresses by getting on the ice and shooting some hockey pucks. Garrett grew up in McKinleyville, California, where he attended a small high school and developed a love for science, specifically biology. While in high school, Garrett spent his free time playing for his high school football team and tutoring his fellow classmates to help them develop an interest in STEM. Garrett is currently majoring in Molecular and Cell Biology at UC Berkeley, where he finds time to work in a research lab at UCSF. He joined SCIFI so that he can help provide unprivileged students with the opportunity to develop a love for science just as he has. PJ currently studies Integrative Biology along with pre-med at UC Berkeley, where he continues to feed his diverse learning appetite in courses such as history, business, and computer science. He mainly grew up in Chatsworth, California, a suburb apart of Los Angeles. He enjoys many different hobbies such as playing basketball, playing the guitar, and seeing movies. Currently, he plans to get his degree then spend time traveling until pursuing a masters degree at a medical college. Roshan was born and raised in the heart of Silicon Valley in Fremont, California, where he developed an affinity for both technology and science. Growing up, Roshan was fortunate enough to have access to amazing teachers and resources which ultimately convinced him to pursue a career in science. As part of Project SCIFI, Roshan hopes to provide the same resources that ultimately pushed him into the sciences to those less fortunate. Roshan is currently studying Computer Science and Molecular and Cell Biology at UC Berkeley and likes to spend his free time playing tennis or coding. Raised and educated in the suburbs of Washington, D.C., Sami was introduced to the issue of disproportionate education at a very young age. Today, he finds himself lucky enough to have had access to a plethora of science courses throughout his primary and secondary schooling and is now majoring in Molecular and Cell Biology at UC Berkeley. Ultimately, Sami hopes to help give less-fortunate communities the opportunity he was afforded.